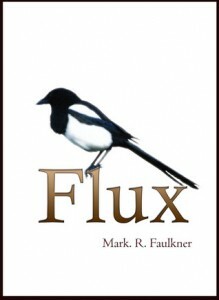 Author, Mark Faulkner, sent me a copy of his horror novel, Flux. I love the cover and (you can’t tell from the picture) its small size. It’s diminutive in all the best ways–just the right size to slip in a bag or largish back pocket. I love books I can carry around with me. Here is the description from Goodreads, so you know the type of story we are talking about. Iain is looking forward to the weekend when a number nineteen bus shatters his body, but broken bones are the least of his worries. In this disturbing, yet darkly funny novel, Iain’s near death experience is not a vision of exquisite godliness with light at the end of a tunnel. Instead he experiences a place of darkness and heat, inhabited by foul creatures, the sounds of suffering and a beast. During a long recovery Iain becomes plagued by nightmares and premonitions, shadowy apparitions, a magpie, and a vile old man. They all have a message, that something wants Iain and it won’t give up easily. Iain’s friends do their best to cheer him up in ways they know how, until the unexpected events of one sunny afternoon mean that he is on his own, caught up in the age old battle of good versus evil. This is unquestioningly a horror novel. There are some scenes that are, frankly, stomach turning. Most involve Bertie and/or feces in some way, yuck (to both of them). But that’s the type of book this is and it shouldn’t be off-putting. If you pick up a horror novel, you should expect some gore and horror. You get plenty of both in Flux. The book does drag at times. Iain spends a lot of time sobbing in bed and sitting at bus stops. But it isn’t enough to put you to sleep, and does serve to highlight the action in contrast. Plus, in Iain’s situation I think I would do the same. So maybe it’s just realism. There are some really interesting characters here. Iain’s two best buds I loved instantly. Beer guzzling, moderately aimless lads in their early twenties who, if I was in my late sixties, I would describe as ‘good boys.’ Though less ostensibly horrific, I felt sorrier for Dave than Iain. You’ll have to read the book to know why. This is a classic novel of light versus dark, good versus evil, sane versus insane. Possibly more the last than the first, but that’s an ontological question that I think the book forces you to address. It keeps you guessing, you’re never sure what will leap out at you (and poor Iain) next. There are a few grammar/typo type mistakes, but not enough to be particularly distracting. I think it is well worth picking up, and if you are a particular fan of horror it’s one you won’t want to miss. Mark was also kind enough to swing by our digital alcove and answer a few questions. Mark, thank you for being here. I really liked the premise of Flux. Do you remember where the idea came from? Was there an initial spark? I have always had loads of ideas floating around in my head! I think Flux started with me writing a paragraph about someone’s life balancing on the edge of a knife and it evolved from there. That first paragraph is still sitting on my laptop somewhere but didn’t make the story. Flux is a battle of biblical proportions for Iain, but is it actually a biblically based text? Would you consider it to be a religious novel? No, not at all. I think I’d be strung up if I said it was! However, religion does offer a lot of interesting concepts to draw inspiration from. Weirdly, the main character in the next one is a monk. My favorite characters where Dave and Gary. They’re everything women often want to kick lads for being, but they try so hard to do right by their buddy. How did you develop their characters? I had fun with these. They are an amalgamation of parts of several good friends and myself. I tried to capture the essence of normal chap, including all the smelly bits. Dirty Bertie. For me, he represents chaos, anarchy and disorder but also free will…and he’s totally gross. There aren’t a lot of grey characters in this book. 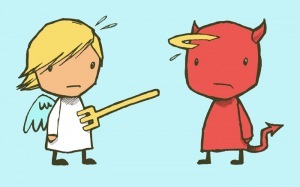 Good and Evil occupy fairly defined camps. Is there a character you would have trouble placing in one or the other? Iain, because he’s caught up in the middle of it all. Also his friends, Dave and Gary because they’re just normal blokes, with a mix of good and not so good in them, like all of us I guess. Do you consider Flux to have a happy ending? No. I did however try to convey a glimmer of hope because I didn’t want to leave the reader feeling depressed. I would have liked to see a little more of Tim and Dr. Goodman. What do you think their role in the book as? Bit characters, sorry. I have their whole life stories in my head, and I edited out a lot of their scenes because I wanted to keep with the main story. Dr Goodman is the ambitious go getter but completely lacking in any spirituality. I almost got rid of her completely but thought she was an integral part of the story. Tim’s been worn down over the years and is starting to question his faith. I left him in because I like him. He’s also an interesting character for Iain to turn to. I understand this is your first novel, what’s next? Any new project you want to tell us about? I’m part way through drafting a dark fantasy, which is taking some interesting turns but might take quite a while. I’m hoping to have it finished later in the year. There are also a couple of novella’s I have plotted but they’ll have to wait. For many years I wanted to be a musician and still play in a band, however, it wasn’t to be. I’ve always daydreamed a lot though, and on occasion over the years have begun to write something down and then thrown it away. Then, when I met my partner she encouraged me to persevere. I wrote a book for practice, just to see if I could. I loved it but to be fair it was a bit rubbish, but I took the things I learned and set out to write something better, armed with the knowledge I could actually finish a novel. I’m hoping the next one will be better again. I learn well by trial and error so each time I write something new, I ask myself how I can improve. How do you come up with such horrific scenes? Do you have a method? No method. Inside my mind can be a pretty chaotic place and all kinds of stuff bubbles to the surface. I thought it happened to everyone but after publishing Flux I’m not so sure. Most of us aren’t lucky enough to start out as a novelist. What were/are you in your other life? I do work but I don’t like to think about it. Writing for me is a way to break up the monotony of the daily grind, to allow my imagination free reign even if I can’t be doing what I want to do because of the working day. What does your writing day look like? I have to cram it in when I can. I don’t have a schedule but try to do as much as I can whilst juggling work and life in general. It can be frustrating because I write better early in the morning but start work at 7. I try to set a very modest word count each day but often miss it. I tend to have a lot of notes jotted down in a messy notebook though to type up when I get the chance. Is there an author you take particular inspiration from? Without wanting to sound pretentious, I get inspiration from almost everything I read with possibly the exception of Bram Stoker. I’m currently struggling through Dracula. When I was writing my first book, I read the Painted Man by Peter V Brett. It blew me away and I told myself, I want to be that good. That helped to push me. I also recently re-read the Fog by James Herbert and thought, Shite, I write a bit like him. So, I guess I’ll say him too because I’ve read a lot of his books, but mainly in my youth. I think something must have rubbed off. If I could write as well as either of the above, I’d be a very happy man. Can I just say, thank you for having me. Thanks for being here Mark. I really did enjoy the book and look forward to your take on a monk. This entry was posted in author spotlight, books/book review, Interview and tagged author, book, book review, interview, questions on May 10, 2012 by Sadie. 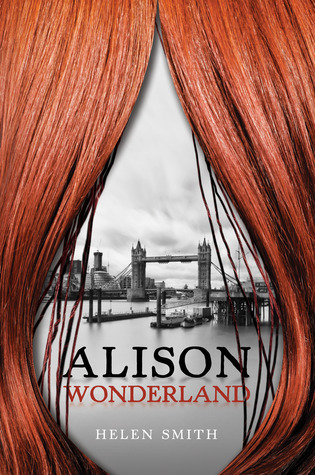 After her husband leaves her for another woman, twentysomething Londoner Alison Temple impulsively applies for a job at the very P.I. firm she hired to trap her philandering ex. She hopes it will be the change of scene she so desperately needs to move on with her shattered life. At the all-female Fitzgerald’s Bureau of Investigation, she spends her days tracking lost objects and her nights shadowing unfaithful husbands. But no matter what the case, none of her clients can compare to the fascinating characters in her personal life. There’s her boss, the estimable and tidy Mrs. Fitzgerald; Taron, Alison’s eccentric best friend, who claims her mother is a witch; Jeff, her love-struck, poetry-writing neighbour; and—last but not least—her psychic postman. Her relationships with them all become entangled when she joins Taron for a road trip to the seaside and stumbles into a misadventure of epic proportions! Clever, quirky, and infused with just a hint of magic, this humorous literary novel introduces a memorable heroine struggling with the everyday complexities of modern life. This entry was posted in author spotlight, books/book review, Interview, writing and tagged author, book review, interview, writing on April 25, 2012 by Sadie. M J Webb is a forty-something father of two from Walsall in England. He is a full time worker and writes in his spare time, though he would love to change that fact. So far, he has penned two novels, ‘Jake West – The Keeper of the Stones‘ and the sequel ‘Jake West – Warriors of the Heynai ‘. A third novel (as yet untitled) will complete the trilogy, though it is a work in progress, which should hopefully be finished by the end of the year. The stories tell of the adventures of fifteen-year-old Jake and his best friend, Ben Brooker. The teenage boys from Lichfield, England discover a box in Jake’s grandfather’s attic, a box that cannot be opened by anyone other than Jake, or a member of his family. Jake opens it by accident for there are no hinges or catches of any description. By doing so, he inadvertently alerts warriors and wizards on distant worlds to its existence. Now he is being hunted across worlds. An epic journey has begun on which his life will be in peril every step of the way and he is about to learn from his grandfather of some strange family secrets. The action is fast and furious. The stakes can be no higher. If Jake West, the new ‘Keeper of the Stones’ cannot protect them, restore them, he cannot go home and the future of our world and many others is at risk. There is a facebook fangroup called, ‘Fans of Jake West’ as well as an M J Webb author’s page. He is also on Twitter, Librarything and Goodreads. This entry was posted in author spotlight, Blogger links and tagged author, book on April 13, 2012 by Sadie.